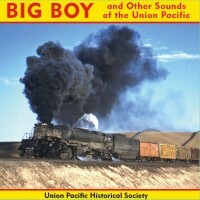 The Union Pacific Historical Society is proud to announce a new product for sale to its members. “BIG BOY and Other Sounds of the Union Pacific” CD, a collection of 26 steam and diesel sound recordings from the late 1950’s, is now available at the UPHS Company store. The digitally re-mastered recordings were made trackside by noted photographer Stan Kistler in Utah and Wyoming in 1957, and in Nebraska in 1958. This CD combines tracks from two of his albums released on vinyl in the 1950’s with the addition of some previously un-released recordings. Here are a few examples of the action captured by Stan’s sound equipment trackside. Please click on the link to hear the sound recordings. Click on the back arrow to return to this page. 1) UP Big Boy 4010 drifts into Cheyenne with an eastbound freight. 2) Union Pacific 2-8-2 number 2206 whistles through Archer, WY. 3) An 4-8-4 works a train through Grand Island, NE. The CD is priced at $15 for non-members and $12 for UPHS members, plus shipping and handling. So add this CD to your collection and support the UPHS. Please click here to purchase your copy of this fine CD.